USA 100 St Francis stays to weather of USA 107 Frenzy. Photo courtesy of Jan Anderson, all rights reserved. Olav V, King of Norway dedicated a silver plate 15 liter cup inscribed with the King's personal crest and the 6 metre insignia to the Puget Sound Six Metre Association on October 19, 1975. The King, in his speech, "hoped for many new constructions in this fine Class which we have all sailed...and loved". 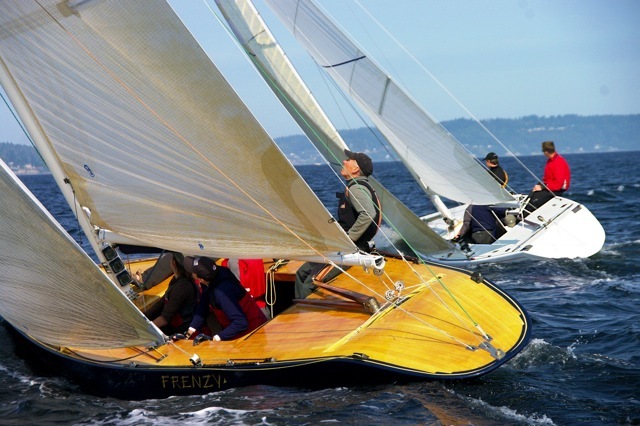 Traditionally, the Olav Cup is the finale to the 6 meter racing season on Puget Sound. The Seattle Yacht Club hosts the Star & Bar Regatta on Shilshole Bay every year almost invariably amid beautiful late summer weather. Winds were too light for racing on Saturday as a light southerly continued to taunt all competitors for most of the day, but never fully came in. Sunday's conditions were ideal, however, with relatively flat water, 8 - 12 knots of breeze, sunny skies and warm weather. Most of the fleet got 4 races in, though the sixes were satisfied to get 3 races to fulfill the King Olav V Cup Deed of Gift requirements. Trevor Di Marco and the crew of USA 100 St Francis V showed the way in all 3 races to take the regatta.